From the creator of the Just a Colorado Gal blog comes a guide to help you plan for a fun backpacking experience. With Backpacking 101 in your bag, you can be prepared for whatever comes your way during your trek—no matter what skill level you are. It’s the perfect resource for anyone ready for an outdoor adventure! Hiking: Does it Help or Hurt Your Love Life? "For expert advice … you’d do well to turn to an about-to-be-published book Backpacking 101. Balogh Rochfort gives easy-to-follow instructions on how to … handle snake bites, bear and mountain lion encounters, getting lost, and medical emergencies. She does all of this in a light, fun-to-read book. So even though one of the key bits of advice in the guide is to keep your backpack light, this book may be a bit of extra weight you’d be wise to carry along." "Your resource guide to hitting the trails! A thorough handbook outlining everything you need to know to enjoy a backpacking adventure. The book is filled with invaluable practical advice ... .With the literary voice of a new-found, knowledgeable friend, Heather delivers the information and advice that you will need to get the most out of your backpacking experience." "Backpacking 101 is exactly what I needed to get me mentally prepared (while I am in the process of getting physically fit). Heather … walks you through step-by-step and details how to hike, tips and skills for being out on the trail, how to set up a campsite, dealing with wildlife (the scariest part for me! ), and what to do if you get lost. Perfect for getting motivated for a trip!" 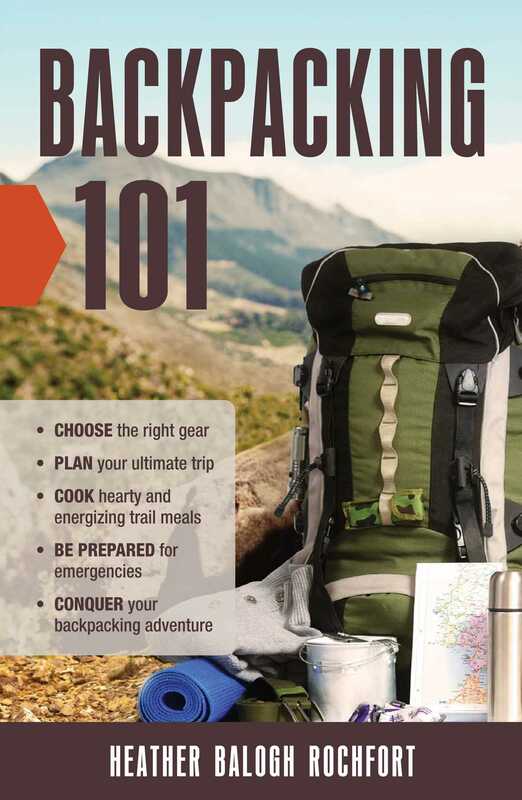 "Backpacking 101 by Heather Balogh Rochfort is a great addition to your adventure library. It shows you how to buy the right gear, plan your trip and be ready for emergencies." "Helpful tips broken down into chapters to aid you in planning your trip, buying your gear and conquering your backpacking adventure." "Heather really covers it all in this book. It’s written for an audience who has zero experience or knowledge about backpacking, but covers topics and includes tips and wisdom that even seasoned backpackers can learn. Backpacking 101 covers the entire gambit of what it takes to go on a backpacking trip; from how to prepare yourself physically, selecting the right gear, and even tips on what to do when nature calls in the woods. Rochfort provides intangible insights on topics that may be hard to find in other backpacking resources." "Backpacking 101 includes expert advice for cragswomen and men of all skill levels — including buying the right equipment, cooking energizing meals on the trail, and dealing with animal encounters." "Backpacking 101 has all the answers you’ll need to move forward. Rochfort covers every topic in this helpful book. Her conversational and friendly style make an otherwise intimidating topic accessible. This book is full of valuable details. I highly recommend this resource for making the leap to multi-day outings." "With this incredibly useful book, anyone can learn the ins and outs of safe, efficient, and fun outdoor travel. Backpacking 101 is an invaluable resource for the modern day hiker. From teaching readers how to set up an environmentally friendly campsite, to teach readers how to safely interact with wildlife, this information-packed book has everything an outdoorsman or outdoorswoman should know." "Written for novice backpackers it clearly covers everything you’ll need to know, answering all of your questions, along with some questions you never knew you had … . Many readers will find Rochfort’s gear guidance super helpful." "A great overview of what you need to know to hit the backcountry trails. Backpacking 101 covers ALL the basics. I especially enjoyed reading backpacking tips from a woman’s point of view. Heather Balogh Rochfort … knows what she’s talking about. I feel confident that in the next few years we’ll be hitting the backcountry more. Part of that confidence comes from education, and Backpacking 101 is a great book for that." "Heather is a true backpacking expert and her book covers all the basics, as well as some clever hacks. The book isn’t geared specifically to parents, but the tips can be applied when you’re backpacking with kids as well."